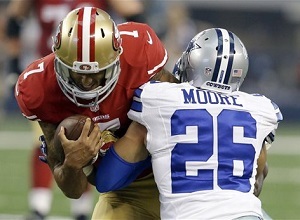 The Dallas Cowboys’ defense has been subject to almost as much criticism as quarterback Tony Romo. Almost. OK, actually it’s still not close — nobody in the NFL takes as much flak from the media and public as Romo — but there are a lot of people who have come to realize that Dallas’ mediocrity over the past few years has as much (or more) to do with their porous D as their much-maligned QB. A year ago the Cowboys had the worst defense in the league, in terms of yards allowed, and predictions for this season were even gloomier. Yet two games into the 2014 season and the Cowboys find themselves ranked 12th in the NFL in total defense, and the players think they can be even better. The Cowboys’ defense seemed to draw a line in the sand at halftime of the opener against San Francisco. The Cowboys trailed 28-3 at the time, but much of that was the fault of turnovers by the offense. The Dallas D held the 49ers scoreless in the second half, then held the Titans scoreless in the first half of last Sunday’s 26-10 win. Moore credits defensive coordinator Rod Marinelli for giving the secondary “more freedom to play the way we want to play,” and says Dallas is playing faster. And the Cowboys have done it without starting cornerback Orlando Scandrick, who is under suspension by the NFL for testing positive for performance-enhancing drugs. But Scandrick could have his punishment shortened if the league changes its drug policy as expected.